South Coast Passport is a popular passport to travel the along the south coast to enjoy Iceland’s most visited tourist attraction. This is an unguided HopOn-HopOff bus passport. You can take your time to travel as long as you stay within the operation timeframe from July 1st to August 31st. The Passport is valid for a return trip from Reykjavík to the Glacier lagoon and back again to Reykjavík. You can hop on and off the bus at any bus stop you choose for a stay overnight or more. The bus stops at towns, small villages and other interesting sites along the South Coast. Our first stop is in Hveragerði, sometimes called 'The Flower Town', which is known for the usage of the geothermal energy in greenhouses and geothermal hiking sites. Our next stop is in the thriving community hub, Selfoss, with many restaurants and cafés. The small tourist village Hella is next. Hella is a centre for travellers that are interested in highland hiking. There it is an option to hop off the bus and buy a bus fare to the unique highland destinations of Landmannalaugar and Þórsmörk. 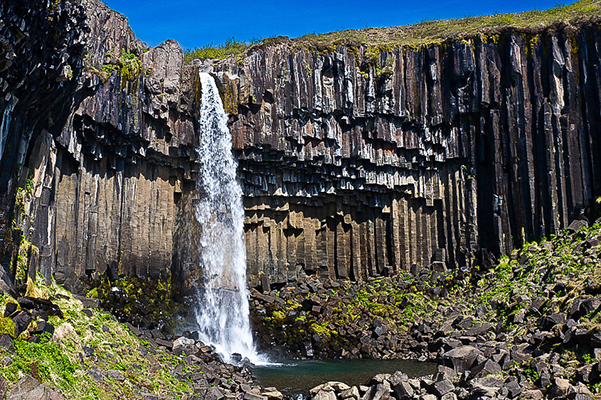 Seljalandsfoss waterfall is a well worth overnight stop at the campsite. There you will find many short and long hiking trails into gully’s and of course the famous path behind the waterfall. Our next stop is at Skógar by the magnificent Skógafoss waterfall. We stop for nearly an hour by Skógafoss waterfall which gives time to walk up to the waterfall and take in its power. 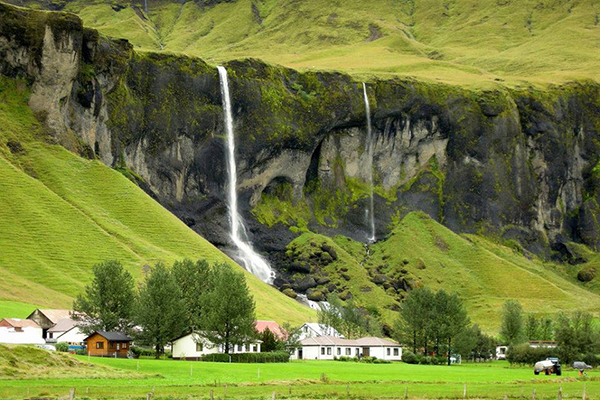 By Skógafoss is a camping place so you can also spend a night or two there. From Skógar, we head on to Kirkjubæjarklaustur village. Kirkjubæjarklaustur is a place well worth spending a night or two at the campsite or book accommodation in a hotel. This is a picturesque site with many hiking trails, and its history is very alluring. The National Park Skaftafell is next. Skaftafell is embraced by glaciers and offers exceptional landscapes. 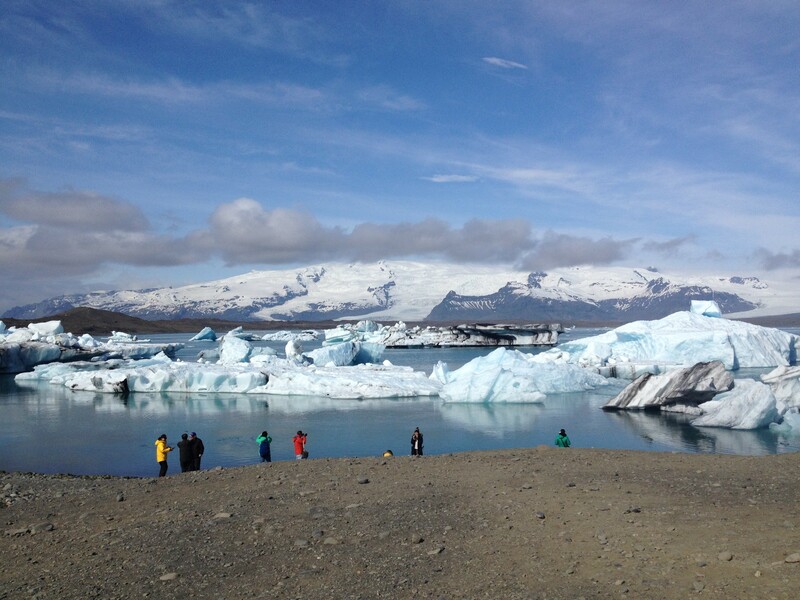 From Skaftafell you can take the bus to the breathtaking Glacier lagoon and stop there for two hours. Please note that there are no camping facilities by the Glacier lagoon, so you must return with the bus to Skaftafell, Kirkjubærklaustur or further. Feel the Freedom of the passport and put up your own itinerary. Selfoss is a town of about 6,512 people in South Iceland, by the banks of the river Olfusá, one of the largest rivers in the country. 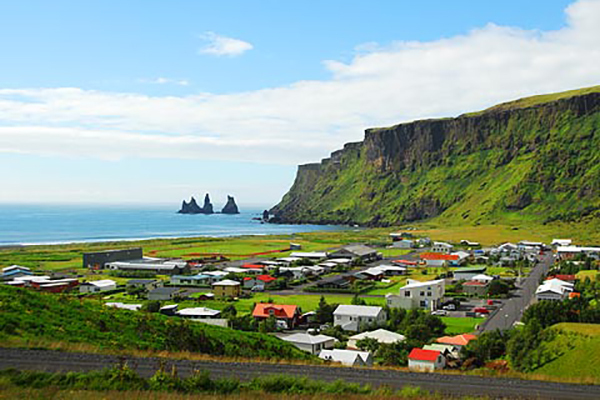 The town is a centre of commerce, farming, horticulture and small industries in South Iceland. Located 50 kilometres (31 miles) from Reykjavík, it is the largest town outside of the capital area in the southwest. It sits on the Ring Road that encircles the country, and is one of the last stops en route to the South Coast. The name is Selfoss is somewhat of an anomaly. The word ‘foss’ in Icelandic means ‘falls’, therefore place names such as Gullfoss, Goðafoss and Svartifoss all refer to waterfalls; there is even a waterfall in the north also called Selfoss. In the town, however, the river is flat, and no one is quite sure why it is named such. Records of the lands near Selfoss date back to the first man to permanently move to Iceland, Ingólfur Arnarson; it was said he spent the winter of 873 to 874 AD here, beneath the mountain that overlooks the town, Ingólfsfjall. However, it was not permanently settled, according to the Book of Settlements, until just after 1000 AD. Being inland, Selfoss was an agricultural centre, at a time when most economic centres were the fishing towns (the coastline is 15 kilometres, or nine miles, away). More commerce came to the region in 1891, when a suspension bridge was built over the river Olfusa, connecting the agricultural south to the capital. This bridge was so important to the country’s infrastructure and economy that is was guarded by British troops in World War Two, after the Allies invaded Iceland following the fall of its colonial ruler, Denmark, to the Nazis. The town was small at the beginning of the 20th Century with just around 40 inhabitants. Its exponential growth over the next decades came from the rise in trade due to the bridge, and the establishment of a large dairy farm and local store which needed employees. More recently, it has become seen as a desirable place to move for those who want to escape the stresses of city living or raise a family closer to the nature. It also has a large college. In 2008, an earthquake struck the town, damaging roads and buildings, killing a number of sheep, and injuring 30 people. The same geological forces that threaten the town, however, also provide opportunity for it, as the activity in the area means that the greenhouse industry has flourished. Selfoss is a cultural hub in the southwest. Every year it has the Sumar á Selfossi festival, which translates to Summer in Selfoss, which includes a fete, musical performers, and an evening bonfire. The town also has the Bobby Fischer Centre, a museum on the life of chess champion; his grave is located nearby. Sports are very popular in the town, most notably football, basketball and handball, largely due to the student population. In 2018, the town announced that it was creating a new town centre, in which it would have reconstructions from historical buildings all around the country. This, no doubt, will only increase tourism and culture in the area. Hella is a small town of around 781 people (as of 2011), located in South Iceland, around 94 kilometres (58 miles) from the capital. It is an important regional centre for the area. Hella’s history dates back to Iceland’s earliest days. Sitting by the river Ytri-Ranga, it was a source of freshwater and a wealth of salmon for the first settlers to come here. In this case, it is not thought they were Norse, but Irish monks. It is suspected that they lived in caves by river. Due to Iceland’s harsh climes, and the fact that the Irish monks often did not stay in Iceland for prolonged periods of time, many caves were used as makeshift homes during this time. Hella was not officially ‘founded’, however, until 1927, when a store was built beside the bridge at Ytri-Ranga. The man who brought this establishment to the town was called Þorsteinn Björnsson, and a memorial to him was built in the prospering village on its fiftieth anniversary. 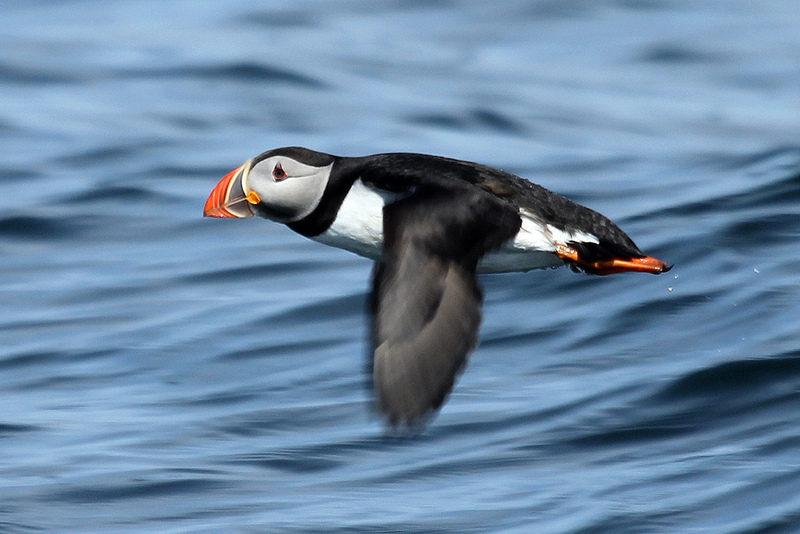 As tourism has bloomed in Iceland, Hella has benefitted hugely. Located on the ring-road that encircles Iceland, it is a perfect location from which to explore the famous sites of south Iceland. Most notable of these are those on the Golden Circle (Gullfoss waterfall, the Geysir Geothermal Area, and Þingvellir National Park) and those along the South Coast (such as the waterfalls Seljalandsfoss and Skógafoss, Reynisfjara beach and the Jökulsárlón glacier lagoon). Other, less visited sites, however, are very close and should not be overlooked, like Sólheimar Eco Village, and the Fridheimar Tomato and Horse Farm. Because of this boom in tourism, Hella’s economy now relies as much on services as it does its more traditional trades, of industry and agriculture. There is, therefore, a wealth of amenities for travellers, and a wide range of options for accommodation, from cosy guest houses and bungalows to hotels. Those taking the ring road around Iceland will, therefore, often spend a night here. Similar closeby towns with similar services and amenities include Selfoss and Hvolsvöllur. Many recreational activities are offered from Hella. As mentioned, the Ytri-Ranga is great for salmon fishing, but guests can also enjoy horseback riding, dog-sledding, and sightseeing tours. Hiking is also popular from the settlement, particularly in the direction of the notoriously explosive volcano, Hekla, which is within clear view. 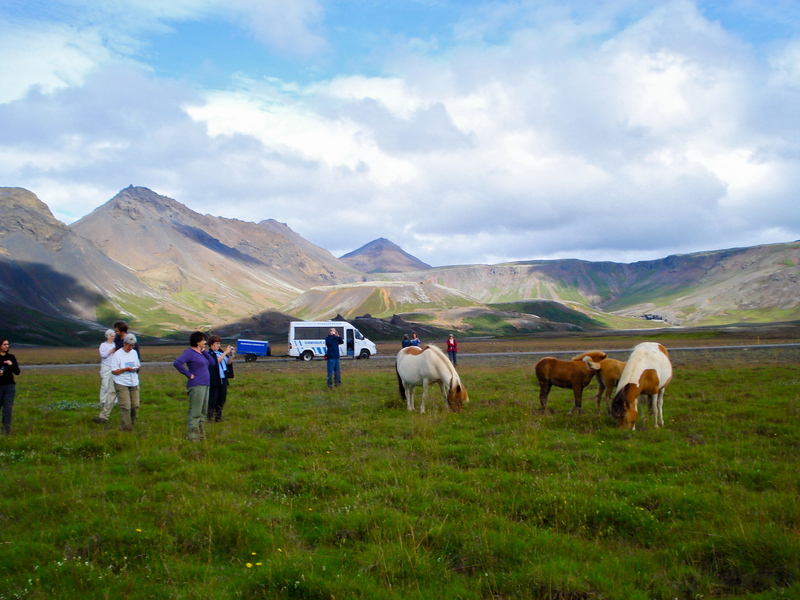 Many also use Hella as a base before taking multi-day hikes, such as those between Þórsmörk and Landmannalaugar. The south-west of Iceland is geothermally very active, and the heated waters are used in the town’s swimming pool, which has several hot-tubs, slides, and facilities for children. Those who want to bathe in geothermal waters more in nature need not travel far, as the Secret Lagoon is nearby. Please note, however, that you will likely have to book your Secret Lagoon tickets in advance, whereas at Hella’s swimming pools, you will be fine just showing up. In July, Hella hosts a festival that is fun for all the family. 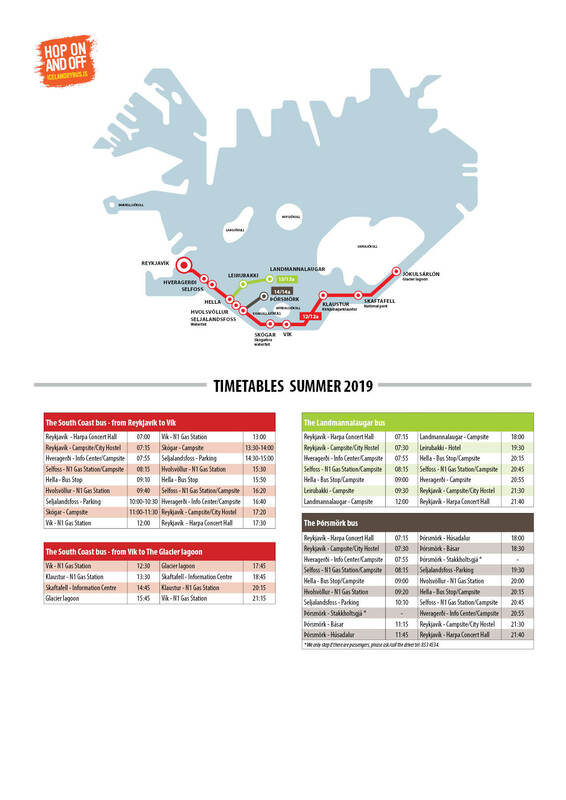 Departure daily at 07:00 from the bus stop by Harpa concert hall and at 07:15 from the bus stop by Reykjavík Campsite. Please be at the bus stop at least 10 minutes before departure. This is a Hop on and Off bus transfer. 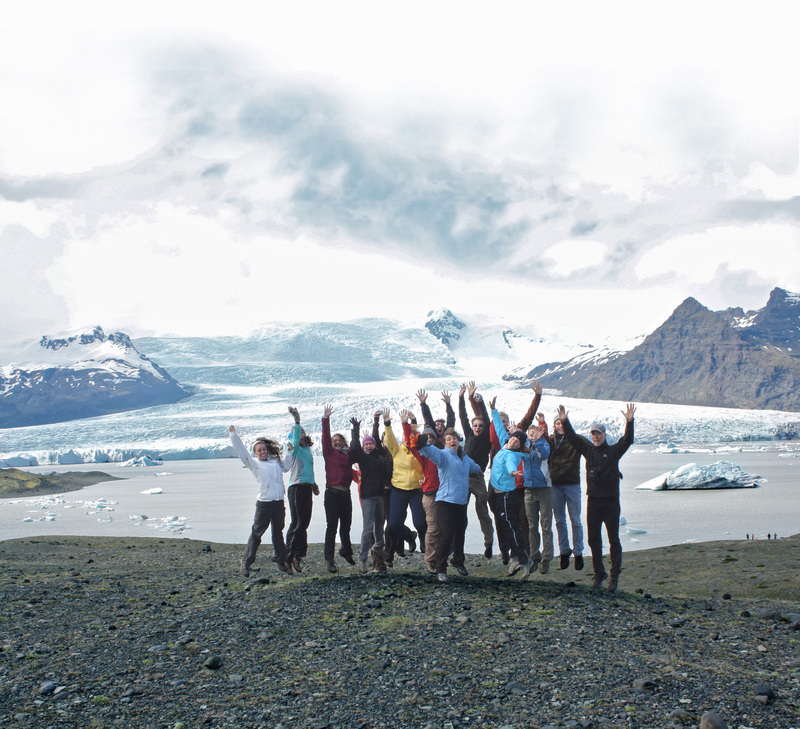 The passport is valid for a return trip from Reykjavík along the South coast of Iceland to the Glacier lagoon and back. You can not backtrack with this passport.